Ⅰ.2018 China Price Statistical Yearbook is a professional annual statistics publication,which covers very comprehensive data in 2017 of price indices. Ⅱ.Data on price indices in this book includ mainly producer price indices for industrial products,purchasing price indices for industrial producers,priceindices for investment in fixed assets,consumer price indices,retail price indices,price indices for means of agricultural production,housing price index,showing the changing trends and the change rates in the prices of production,trade,consumption and investment. 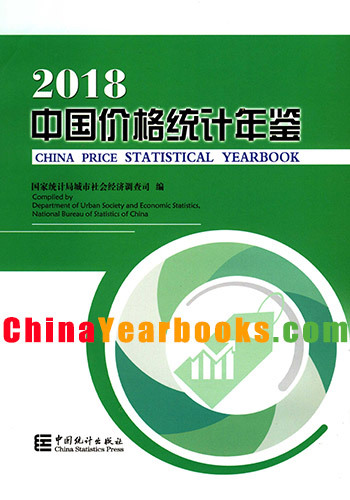 Ⅲ.Compilation of statistics on price indices is organized by the Department of Urban Social and Economic Survey,NBS.At levels of National Bureau of investigation team and relevant statistics in stitutions collect data in accordance with the scheme of price survey system,tabulate them and report them. Ⅳ.The national data in this yearbook do not include that of Hong Kong SAR(Special Administrative Region),Macao SAR and Taiwan province. Ⅴ.The units of measurement used in this yearbook are in accordance with internationally standard measurement units. Ⅵ.In this yearbook,“blank space”indicates that the data are unknown or are not available;“#”indicates a major breakdown of the total.